Brand education and training is a core competency of The Blake Project, the brand consultancy behind Branding Strategy Insider. As practitioners and educators we deliver interactive brand education programs designed to meet your specific learning objectives as well as align individuals and organizations with essential concepts in brand management, empowering them to realize their full potential as professionals and release the full potential of their brands. Further, for organizations seeking to educate and energize their employees in support of the brand we custom design and develop brand academies / brand centers of excellence which include delivering training on multiple platforms, such as classroom, mobile and on-demand. Abbott, Air France/KLM, Bayer, Bloomberg, Bombardier, Darden Restaurants (Olive Garden, Red Lobster et al), Equifax, GE, GlaxoSmithKlein, HP, Intel, Kawasaki, OgilvyRed, Monsanto, TD Ameritrade, T. Rowe Price, Unilever and Wyndham Worldwide. 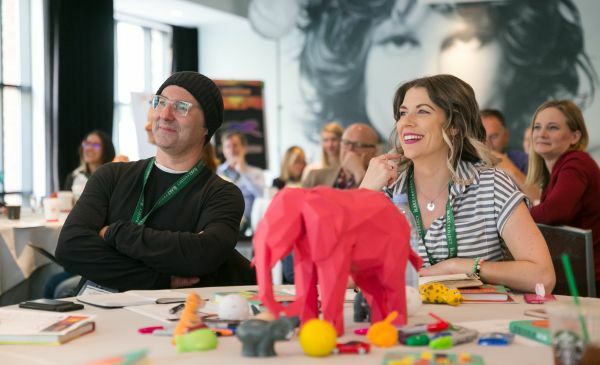 The Blake Project is engaged to design learning and development training on a wide range of marketing topics that support your strategic goals, inspires commitment to learning and engages the hearts and minds of learners. These include: How to build an attention capturing brand, How to build a challenger brand, Positioning brands to win, 50 ways to differentiate a brand, The most powerful sources of brand differentiation, B2C and B2B brand messaging strategies, Brand storytelling for deeper connections, How to build a purpose driven brand, How to build a competitive advantage, Defining the customer journey, Building brands on meaning, not marketing, Brand planning, Building lovemarks, Brand leadership in an age of disruption, Building human-centric brands, Growth strategies, Brand innovation, Behavioral science, Customer experience, Digital strategy and The future of brand competitiveness.